Charles Oakley called again on Wednesday morning. And then again late afternoon Thursday. Combined, he went off on everyone and their mom for maybe 30 minutes. He said it might take him three to five years to feel right about returning to Madison Square Garden. He said he felt a kinship with Draymond Green when he heard that the Golden State Warriors forward had talked about Oakley’s situation as a white team owner dismissively treating a former black player. He talked reverently about his late grandparents, who grew up in Jim Crow Alabama and whose struggle he feels the need to honor today. He took aim at NBA commissioner Adam Silver, who he said had “tricked” him into being a part of a meeting with New York Knicks owner James Dolan for the sake of public relations. He said he has lost all respect for the three former Knicks players who sat with Dolan during a game at the Garden last week. And he wondered aloud why his most celebrated former Knicks teammate didn’t say anything on his behalf during the most hellish week of his life. “Any time for Patrick [Ewing] to speak up, you think this would be it – he was my closest teammate who played with me,” Oakley said. He’s emotionally wounded. He feels like a pawn in his own life, sacrificed for the good of the Knicks and the NBA. That come-to-Jim meeting between Oakley and Dolan, the one mediated by Silver – and including Michael Jordan by conference call – that lasted between 45 minutes and an hour on Monday at the league’s offices in midtown Manhattan? But in hindsight, Oak said he feels it was calculated to steer All-Star Weekend away from the ugly spectacle of his arrest-by-force at Madison Square Garden on Feb. 8. It didn’t fix the years of ill will between himself and Dolan that detonated in the Garden stands last week. Bygones can’t be bygones yet. 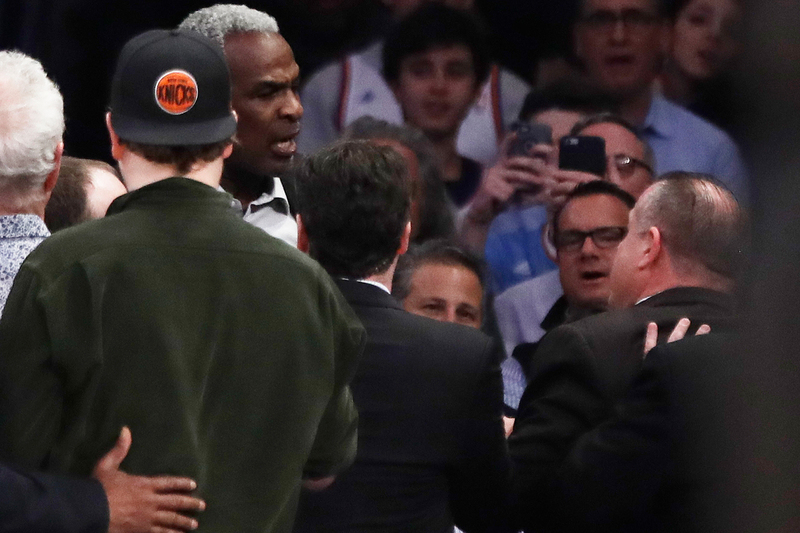 Former New York Knicks player Charles Oakley exchanges words with a security guard during the first half of an NBA basketball game between the New York Knicks and the Los Angeles Clippers on Feb. 8 in New York. Charles Oakley III is a stubbornly proud man, the most stubbornly proud I’ve ever covered. He can get in his own way as much he can forge a path forward for himself, and he’s clearly done a lot of each the past week. When it was mentioned in the meeting with Silver that he is not blameless in this episode, he told them he wasn’t after a job or a special day for himself at the Garden, where he played tenaciously for 10 consecutive playoff teams between 1988 and 1998. He just wanted his name cleared after Dolan opined that he was an alcoholic and had anger issues. No job offer can buy the silence of the grandson of Florence and Julius Moss, who helped their daughter Corine raise him as a child in Alabama before the family moved to Cleveland. “I wouldn’t be respecting what my grandmother and grandfather put their lives on the line for when they was growing up,” he said. “They were getting beat up, never having a right to speak up. We didn’t have a voice back in the old days. Did we have a voice back in the ’50s and ’60s? The moment race is brought up in some corners it becomes mistaken for racism or race-baiting. But you can’t take that part of the equation out of what happened with Oakley last week. Etan Thomas, Oakley’s former teammate in Washington and an advocate for civil rights in his media career now, said that watching the Oakley incident unfold brought back disturbing images. From the “replayed reel of Eric Garner being surrounded by police and choked to death, Thabo Sefolosha’s leg being broken by NYPD, tennis star James Blake being tackled to the ground by NYPD and countless other cases, there was a disturbing racial component seeing security and police surrounding Oakley in the Garden, dragging him out of view and tackling him to the ground,” Thomas said. Thomas would like the NBA to take a hard look at how Dolan and the Knicks handled the incident, saying it could have easily ended in tragedy. Kevin Blackistone, the ESPN commentator and Maryland journalism professor, compared the treatment of Oakley by Garden security to “a guy on the street selling loosies,” alluding to someone selling loose cigarettes, for which Garner had been accosted for by New York City police. There was also something tone-deaf about Dolan inviting three former players to sit alongside him in the first game after the Oakley incident – Latrell Sprewell, Larry Johnson and Bernard King, all of whom are black. Wearing a Charles Oakley jersey, director Spike Lee returns to his seat during the second half of the New York Knicks game against the San Antonio Spurs at Madison Square Garden. 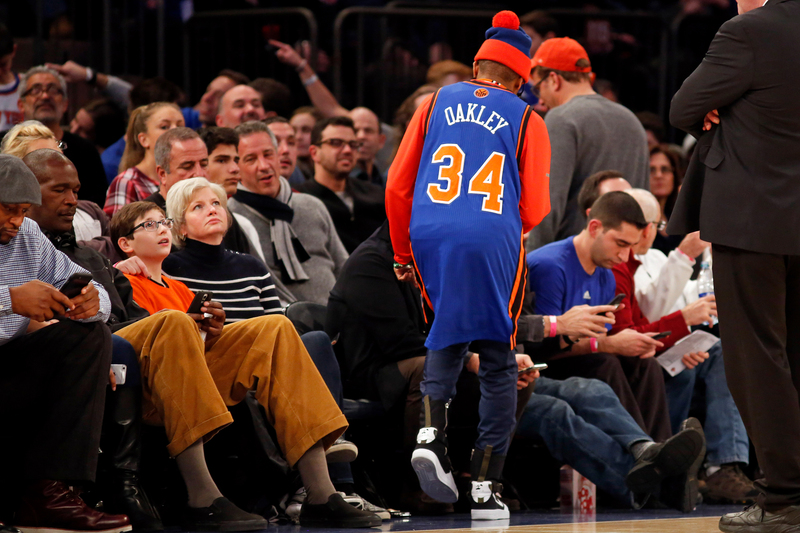 “I’m really pissed about how they brought those guys back to sit with him,” Oakley said. “Bernard King is a legend and everything, but he went through an incident where he was wronged in college by the police. Let’s be clear: Oakley obliterated polite physical boundaries after he was told to leave and a security guard appears to have touched his shirt. He shoved and pushed until he was forcibly removed. But Dolan, a recovering alcoholic for many years, went beyond the pale in his response. “I’m sure he has problems,” he told the New York Post’s Mike Vaccaro. “When you’re fighting addiction, it’s not that much different from anger management or other diseases where you can’t control yourself. The first step is to turn that around for yourself, is admitting you have a problem. And then, from there, you can begin to take the steps to take control back in your life. This was character assassination. Dolan has no evidence that Oakley has a drinking problem. And, even if he did, any addiction and recovery advocate will tell you that conducting a public intervention – in essence, shaming them – is the worst way to help someone. It stigmatizes the person and inhibits recovery. Later, without evidence, he told SI.com that Dolan had similarities to Donald Sterling, the former Los Angeles Clippers owner banned for racist comments that became public. He’s upset with Silver, he said, because “the commissioner thinks he did a good job.” But Oakley believes the three-sentence statement the NBA put out after the meeting should have been approved by him as well as the other parties involved. Not all Oak’s feelings jibe with the facts. The truth is, Oakley’s lawyers called for a meeting with Dolan and the commissioner. The truth is, the people in that room agreed a short statement would be released. They tried in vain to get in touch with Oakley for four hours and when they couldn’t, Jordan, acting on Oak’s behalf, said he’d be fine with everything Silver said. I kept asking Oak what the endgame was, what he needed to have some closure. “I don’t want this to spin it like everything is OK. This man called me an alcoholic. I have four or five business deals on the table and I can’t go through with them now because I’ve been called an alcoholic. Reached for comment, neither the NBA nor the Knicks wanted to respond publicly. The only person talking about this going forward will be Charles Oakley. And right now – Lord help him – he just can’t stop.